With thriving city centers, beautiful landscapes and riverfronts, and charming covered bridges, there's plenty to love about Iowa. Start planning your getaway to the Midwest, and stay awhile in your pick of Iowa vacation homes. As Iowa's largest city, Des Moines should be at the top of your list of destinations. Iowa's capital city is known for its vibrant downtown shopping area, cultural attractions, and hundreds of miles of trails. See a world-class performance at the Des Moines Metro Opera, Ballet Des Moines, or the Des Moines Symphony. If you prefer visual arts, catch the latest exhibit at the Des Moines Art Center or stroll through the Pappajohn Sculpture Park. Grab a bite to eat at the Downtown Farmers Market, and get some exercise on the skywalk or on the city's trail network. Situated at the start of the Missouri River, Sioux City is a fun stop in northwestern Iowa. Take a walk along Historic Fourth Street to get a sense of Sioux City's small town charm, and head to The Riverfront to learn about the area's history at the Lewis and Clark Interpretive Center or see a show at the Anderson Dance Pavilion. Train buffs won't want to miss the Sioux City Railroad Museum, a 30-acre site that houses a former industrial locomotive complex. Next, make your way to Iowa City, the only place in North America to be named a UNESCO City of Literature. Seek out inspiration along the Iowa Avenue Literary Walk, which includes bronze plaques and inscriptions from 49 Iowan authors and playwrights. Visit the University of Iowa campus, attend the Iowa City Book Festival, and check out free movies and concerts on the city's pedestrian mall. For more than 150 years, the Amana Colonies have been a respite from everyday life in Iowa. Tour the seven villages, sample locally made food and wine, and decorate your home with crafts and antiques. If you plan your visit right, you can attend one of the Amana Colonies' popular annual events, like Maifest in May, Wurst Festival in June, or Apfelfest in September. The Mississippi River is a substantial resource in the Midwest, and the National Mississippi River Museum and Aquarium shows off the area's history through exhibits, 4D films, and interactive experiences. Discover how important the Mississippi River is to Iowa and the rest of the nation, and visit the Mathias Ham House to learn about 19th-century life in Iowa. If you're a fan of Field of Dreams, stop by the Oscar-winning movie's site in nearby Dyersville. On a nice day, this is the ideal place to play catch and round the bases. From modern apartments in walkable urban neighborhoods to riverfront log cabins, you'll find a variety of Iowa vacation homes. Stay in bustling Des Moines, discover the charms of small-town life in Iowa City, or get away from it all in northern Iowa. 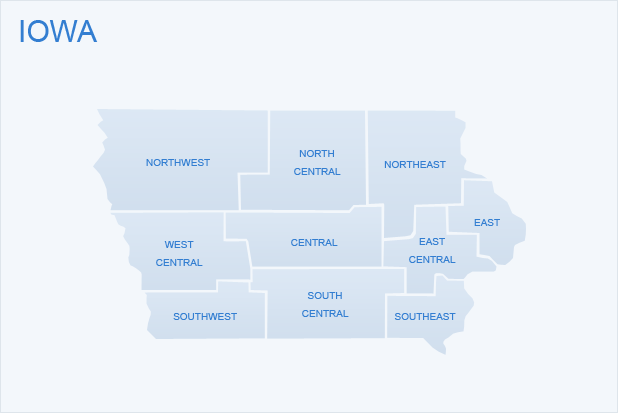 Whether the city or the country calls, settle into your choice of Iowa vacation homes and enjoy your trip to the Hawkeye State.